Why Choose Irvin Bullbars As Your Bullbar Supplier? We are experts in the design and manufacture of alloy bullbars. The correct Alloy offers superior strength, from the high-density extruded channel to the industry leading wall tubing thickness of 4.5mm, which all contribute to that stronger bar. Our friendly and professional approach is regularly commented on by customers. If you want to deal with experts who care about getting the service right, every time, get an Irvin Bullbar. Ultimately, an Irvin Bullbar means you can drive with confidence and peace-of-mind that you and your passengers are safer on the road. Our bars are different, as a standard, all of our bars have LED indicators, spotlight and Aerial lugs if required, your choice of polished or powder coated finishes and all bars are ADR compliant including airbag compatible. 10 Steps to Building the Best Bullbars – Bar none! An Irvin Bullbar is built in accordance with a strict 10-step process to ensure maximum quality, strength and finish in all of our bar work. Up to 40 hours of research & development goes into every bar to ensure that they are engineered to perfection. Materials are purpose selected for maximum strength. With over 40 years experience, only select the best. Our bars are made from continuous sections of channel & tubing to make the bar stronger. Hand-rolling of the channel sections & mandrel pipe bender used to ensure a flawless finish. Our bars are built to Australian Driving Regulation & Department of Transport specifications 0589. Two separate welding processes used to maximise the bonding strength of the individual components. Individual components of each bar are professionally hand-assembled by highly trained specialists. Each bar is carefully hand polished to a chrome-like finish to give your bar that impressive metallic shine. 16-step-ceck is made to all finished bars by an experienced quality control specialist. Our bars are different, as a standard, all of our bars have LED indicators, spotlight and Aerial lugs if required, your choice of polished or powder coated finishes and all bars are ADR compliant including airbag compatible. As long as it’s still ADR approved you can also customise your bar and make changes. (Conditions apply). 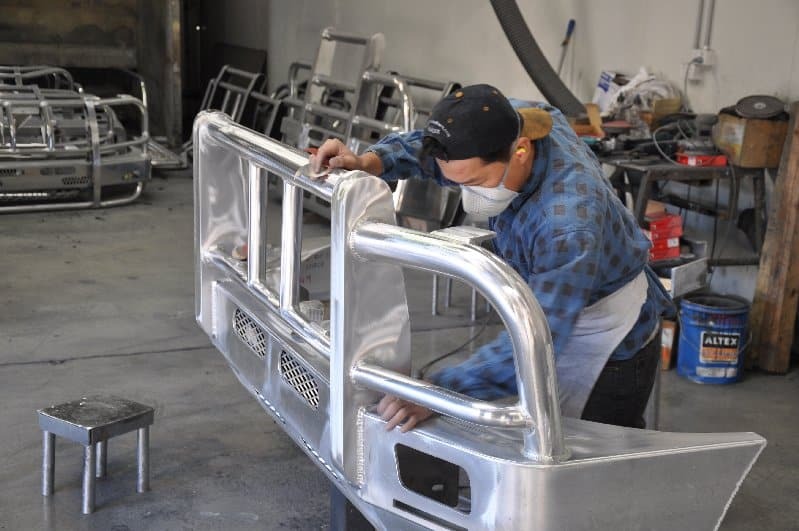 Giving Back – Irvin Bullbars is giving back each time we sell a bullbar. Each bar that we sell keeps integral support vehicles on the road.